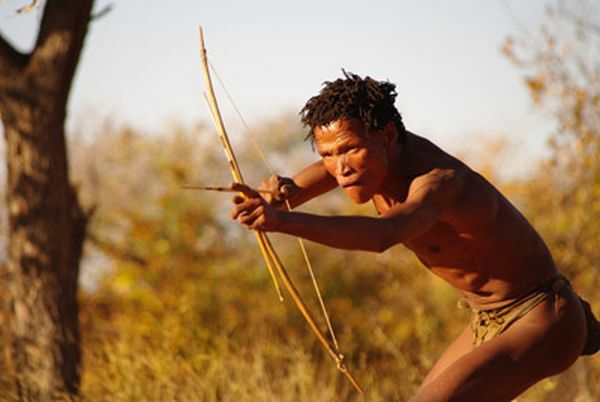 The San bushmen of the Kalahari desert have a unique way of hunting – running down the prey. They first form a group, zero down on the slowest animal in a herd after following them for a while. Then they separate him from the rest of the group. Next they decide to chase the animal. Their "persistence hunting" technique involves running, walking and tracking until the prey is exhausted. One by one they take turns to chase the animal, not giving it time to rest. The animals because of excessive hair need to slow down and pant, to cool their bodies. Unlike humans who can sweat and cool down even as they run. Besides, the bushmen carry water bags to drink and pour on their heads to cool down further. Because of this, while animals are pretty good in racing ahead in short sprints, they start slowing down when chased continuously. This hunting continues as the bushmen take turns to rest and chase. Until the final chase when the fastest runner among them continues the chase till the animal falls to the ground in sheer exhaustion. And the bushmen take it home to feed their family. Persistence technique to weaken your prey. Nice one.